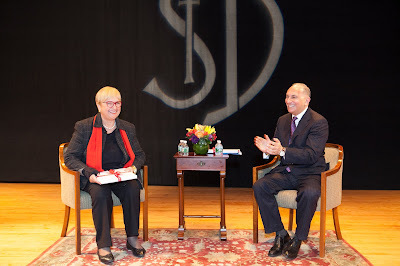 On Tuesday evening, Lidia Bastianich, award-winning chef, restaurateur, television host and author, visited Saint David's to speak to the Saint David's Alumni Parent community and current Eighth Grade. Interviewed by Alumni Parent Dr. Joseph Haddad for our Alumni Parent Council Lecture, Lidia recounted her youth in Istria when the once Italian peninsula shifted to communist reign after World War II, her two years spent as a refugee in Trieste, and her experiences after her family immigrated to America when she was eleven years old. The boys were fascinated with her discussion about her family's escape from Istria and her life as a refugee and immigrant. 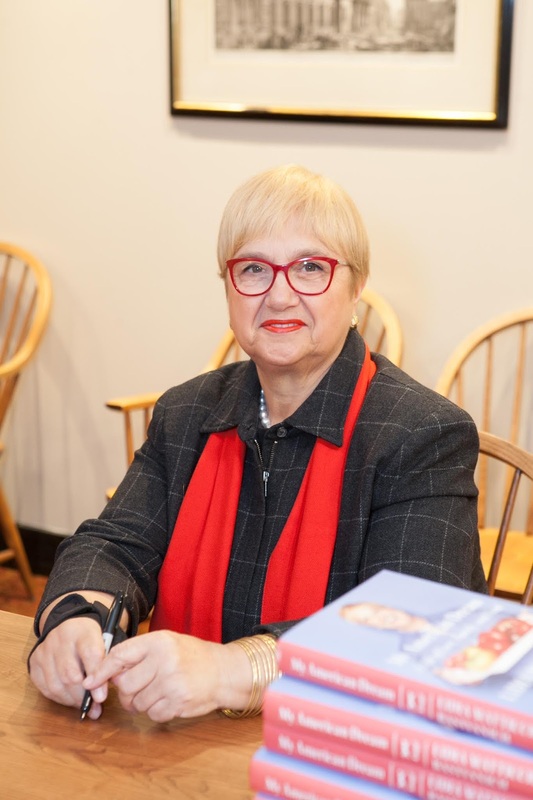 She expressed her everlasting gratitude to the people who provided assistance to her family in Trieste and when they first arrived in New York. "I can't talk enough about the goodness of the people who helped us," she said. "I am where I am because of them." As a highly successful person with strength, humility and gratitude, Lidia expressed her conviction that "it is essential to have a spiritual connection" and to give back to others. She does this in particular through her work with non-profit organizations of women leaders in the food and hospitality industries and in her support of refugee education. 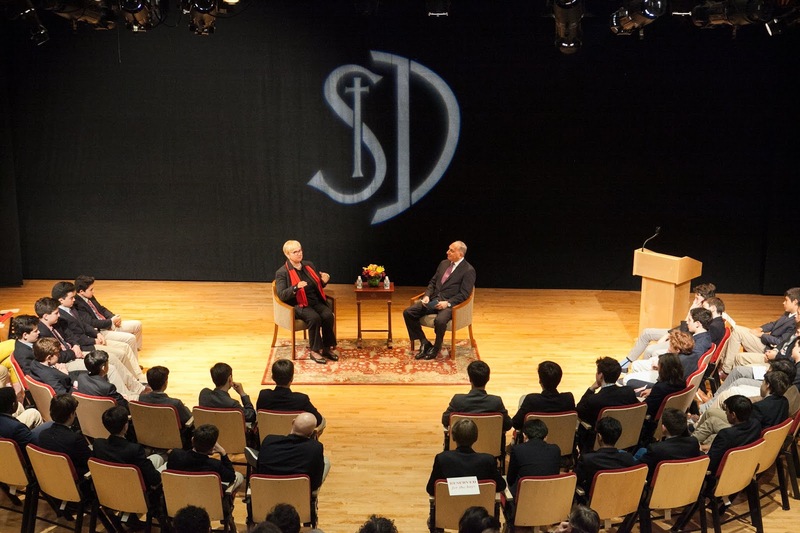 When it came the boys' turn to ask Lidia questions, they discovered that she considers it of paramount importance to learn from people you admire and then, later in life, become a mentor yourself; that she counts among her life's greatest awards not the accolades that have been bestowed upon her, but the joy of doing what she loves and spreading her life philosophy; and that the historical person she would most want to prepare a meal for is Leonardo da Vinci. The boys and audience left inspired to be their best selves, as she closed by encouraging our boys to be true to themselves in pursuing their passions and willing to do the work necessary to achieve their dreams. 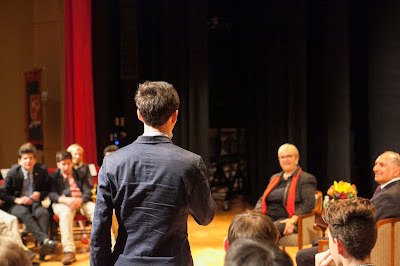 Each boy received a copy of her new memoir, My American Dream - A Life of Love, Family, and Food. The Alumni Parent Council Lecture Series is an annual event that brings renowned guests to the school to speak with our graduating class and alumni community, or provides our boys and guests with a unique experience at a cultural institution. 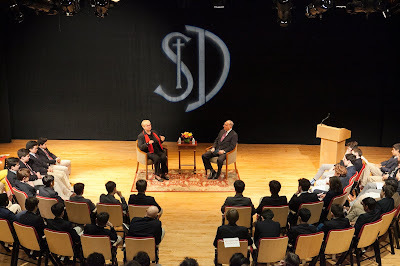 This was the first time the event was held in our new Otto-Bernstein Performing Arts Theatre. Much appreciation to Ms. Bastianich, our Alumni Council Co-Chairs Annie Haddad and Winne Feng, Joe Haddad and Assistant Director of Development John Dearie '95 for bringing our community such a delightfully delicious evening!